Transit • UTA officials insist the line doesn't need blaring noises to meet safety standards. Francisco Kjolseth | The Salt Lake Tribune Officials, media and work crews welcome the first FrontRunner train as it arrives in Utah County at the Lehi Station on Monday, June 11, 2012, marking the beginning of the testing process of the new commuter rail line that links Provo to Salt Lake City. The Utah Transit Authority and a dozen cities are beginning a process to make the new 45-mile FrontRunner line between Salt Lake City and Provo a horn-free quiet zone for trains. At first glance, that may seem at odds with UTA's highly publicized recent push for greater safety amid a rash of train accidents with cars and pedestrians during the past year. But officials said Wednesday they are confident they can achieve sufficient safety without constant horns that would annoy neighbors. "What we are doing is offsetting the loss of the safety value of the horns through other treatments," said W. Steve Meyer, UTA's chief capital development officer. To avoid the need for horns as they approach road crossings, he said, federal rules require that each crossing at least have warning lights, crossing guards and raised medians to prevent cars from driving around lowered gates along with signs warning that trains do not blare horns in the area. Meyer said UTA is providing not only those, but also additional safety features for pedestrians, including signs at their level, tactile strips and "zigzag" gates. "You will not be able to walk straight through any of our crossings," Meyer said. "You're going to hit a fence, hopefully making pedestrians look around for trains." Silencing the horns is seen as a community plus. "Where there have been 15 to 20 freight trains a day [along parts of the corridor], we're going to have 60-plus commuter rail trains on top of that," Meyer said. " … It's a benefit to all the people living along the corridor, and won't adversely affect safety." The UTA board, meeting in subcommittees Wednesday, gave an initial nod to an interlocal agreement with a dozen cities to apply to the Federal Railroad Administration for approval of the quiet zone. Meyer said the federal agency requires cities to apply for such zones, but UTA provides much of the information needed. The agreement calls for Lehi to be the lead applicant, followed by Salt Lake City, South Salt Lake, Murray, South Jordan, Sandy, Draper, Bluffdale, Lehi, American Fork, Vineyard, Orem and Provo. A similar quiet zone took hold in 2008 for the FrontRunner's 44-mile northern line between Salt Lake City and Pleasant View. Meyer said the process requires public notice and allows residents to seek hearings or submit comments. 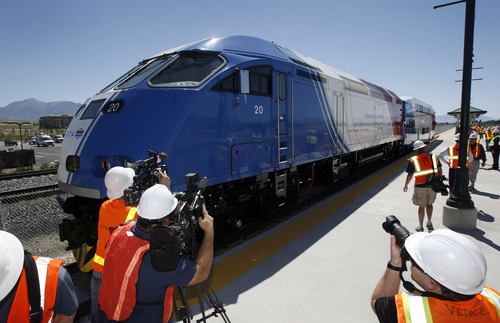 UTA is conducting operational tests on the new FrontRunner route before its December debut.